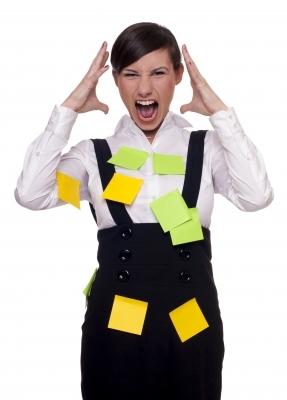 What is your approach to meeting deadlines? 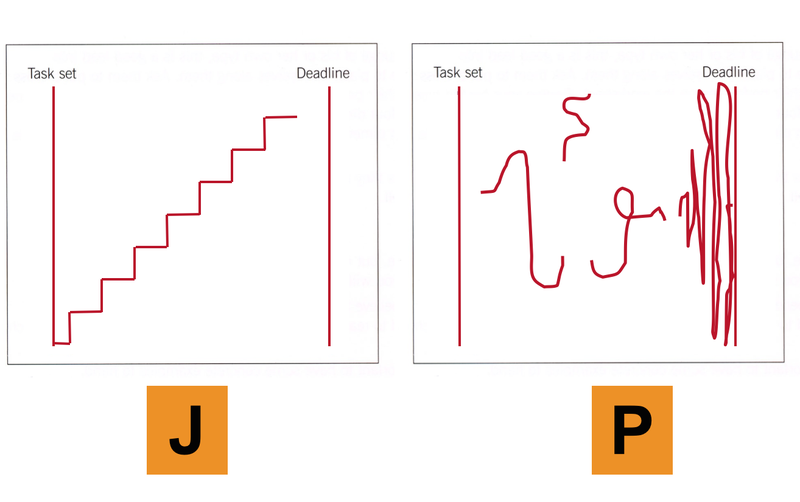 Which picture best illustrates your journey to meeting a deadline? Comment below by simply posting the letter J or the letter P.
Semester 2: Stop trying to change yourself, change your story instead! Having spent 20 years as a student (from starting primary school to successfully completing my PhD) I am familiar with the creation of good intentions. Let me share with you one example from my life about a period where I had lots of good intentions and had tried to change my behaviour: Secondary School. I found my first 2 years at Secondary School difficult. I had tried to concentrate more in lessons, I had tried to have more confidence in my academic abilities, to commit to do more homework etc. but no matter how much I tried to change myself and my behaviour it never seemed to work. I reached a point during the summer holidays at the end of my second year at school when I decided that I had to do something about the situation. I wanted to do well and be successful but on this occasion I somehow realized that the only thing in my way was myself. Although at the time I never expressed it in these terms, instead of trying to change myself, I simply made a decision to change the story I was telling myself and therefore to see myself differently. At the time, aged 11/12, the story in my head went something like the following: “I am just no good at this academic stuff. Getting good grades is not possible for me. I am just not intelligent. Those students over there are clever. There’s no point even trying because people like me just don’t get good grades”. Whilst I never verbalized this narrative it totally dominated my thinking and my behaviour. Naturally, I acted in accordance with my story. Further, my story also ensured that each of my good intentions failed. I had no idea of the magnitude of the effect that changing my story would have on my immediate future and also the rest of my life. Once I changed the ‘story lines’ about myself I completely changed my reality and the results I was getting. Let me suggest five ways to take control of your story: 1. Become aware of your story: Listen to the story playing in your head. Simply recognize the story which is playing over and over again in your thoughts and mind. It may take some time to detach yourself sufficiently to realize your story, as you may have grown so accustomed to it. 2. Write down the ‘story lines’ that make up your story. Everyone’s lines will be different. Examples could be: • “I can’t do…” • “I am not intelligent enough for…” • “I don’t have enough experience for …” • “People like me can’t….” The lines that make up your story will be particular to you. 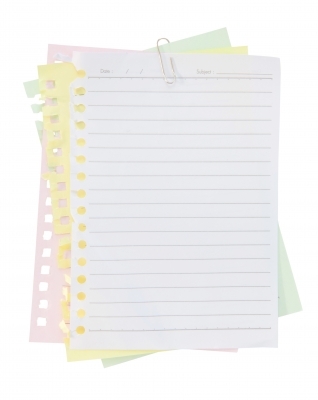 Listen carefully and simply write it down exactly as you hear it – no editing! 3. Assess whether your story is working for you or working against you. Is your story supporting you and enabling you to achieve the things that will help you move forwards on your course/in your life or not? Be honest. 4. Create a different story. Shift your perspective from one that has probably been based on some total or partial distortion of the truth (which created your old story) to one that is based solely on the truth. I am not encouraging you to lie to yourself or to do some woo woo positive thinking. Rather I am asking you to see yourself as you really are. 5. Start the new story. You have to replace the old with the new. You can’t just say I don’t want to do/be….’ That is a good first step in some respects but to make a lasting change you have to replace the old (negative/outdated behaviour/results etc.) with the new behaviour/habit etc. in order to get the new desired results. Anytime you hear the old story start, simply interrupt it by repeating your new story. Once I realized the detrimental effect my story created, I created a new story. The long term effect of this was that I went on to achieve a First Class honours degree (the only person on my course to do so) and a PhD from one of the country’s top Criminology School. I also went on to work for Cambridge University as an academic researcher! Don’t waste any more time trying to change yourself or your behaviour, instead take the first step and become aware of the story you are telling yourself and change that. Then watch and see how much easier it is to fulfil your good intentions and get the results you want on your course/in your life. 1. What story are you telling yourself? 2. What story do you need to create? As a returning student to university, can you observe a pattern of behavior/habits that has led to you getting the results you have got, during your time at school, college and university? If you are not happy with this pattern or the results you have received, please consider the following 10 points to help you become even more aware of some of the potential reasons for this. We keep focussing on our weaknesses rather than cultivating our strengths. We keep saying ‘Yes!’ to every social event that we are invited to. We repeat the same old habits/patterns. We don’t ask for help. We don’t give ourselves permission to be excellent. We leave things to the last minute. We keep thinking the same thoughts. We copy the majority and what they are doing/not doing. We don’t access the support that is available to us. We keep on believing the ‘old’ negative labels of teachers or other authority figures about what is possible for us. 1. Which of the above do you keep doing? 2. What else would you add to the above list? 3. What could you do to get a different outcome? 4. What has led to successful results/outcomes?